Fans Of Popular Works Of Fiction Who Desire To See Their Favorite Characters In A Relationship Are Known As? Similar To The Y2K Bug, There's A Looming Date Bug Triggered By The Year? If you’ve ever been sitting there watching a particular TV show and thought it would be really cool if two of the characters got into a relationship (within the context of the show), you’ve touched the edge of a fandom world known as “shipping” and the “shippers” who make it up. The terms, derived from the word “relationship”, originated during the 1990s as a result of the nascent world wide web and ultra fans of the sci-fi show The X-Files colliding. Fans on early internet forums who wanted to see Agents Mulder and Scully form a romantic relationship were dubbed “relationshippers” (which was eventually truncated to just “shippers”) and fans who wanted their relationship to stay professional and platonic were called “noromos” (why the term never caught on, we’ll leave as an exercise in pondering for the reader). Since then, as the internet continued to provide a ready platform for fans of various television shows to share comments, ideas, fan fiction, and fan art with each other, the intensity and breadth of “shipping” has greatly expanded to the point where some debates over various “shipping” desires read more like blood-fueled family feuds than two fans talking about a fictional world. Lest you think that the concept of “shipping” is new, know that the term might be a 1990s-era coinage, but the concept predates the decade and The X-Files by quite a bit. 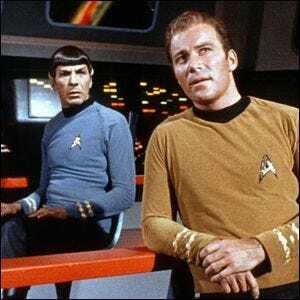 One of the earliest (mid-1970s) and most famous examples of a long running and dedicated relationshipping fandom surrounds the premise that Captain Kirk and Commander Spock of Star Trek should be in a relationship (referred to as”K/S” fan fiction). It would seem that as long as there have been TV show characters for people to fixate on (and some way to share their desires for their favorite characters to get together), there have been relationshippers, coined term or not, waiting in the wings.